San Diego, CA, April 1, 2016 - San Diego Self Storage facilities span San Diego County from Oceanside to Otay Mesa. The organization wanted to find a way for all 17 locations to develop meaningful ties to their local communities. Each site was given $500 to contribute to any organization they see fit. The staff collectively decides and organizes a meeting with their chosen organization. In 2015, numerous children’s organizations and pet-friendly charities were the most popular beneficiaries. Poway Road Mini Storage Managers Steve & Tally have a sincere love for animals. Last year they selected their local chapter of the Human Society for their donation. This year, they donated to two pet-friendly organizations, The Petco Foundation and Second Chance Dog Rescue. “We chose these organizations because we love our pets and want to help less fortunate animals that are suffering. We believe that all animals deserve a chance at a good life,” remarked Steve and Tally. At the Petco Foundation, we believe that every animal deserves to live its best life. Since 1999, we’ve invested more than $167 million in lifesaving animal welfare work to make that happen. With our more than 4,000 animal welfare partners, we inspire and empower communities to make a difference by investing in adoption and medical care programs, spay and neuter services, pet cancer research, service and therapy animals, and numerous other lifesaving initiatives. Through our Think Adoption First program, we partner with Petco stores and animal welfare organizations across the country to increase pet adoptions. so far, we’ve helped more than 5 million pets find their new loving families, and we’re just getting started. 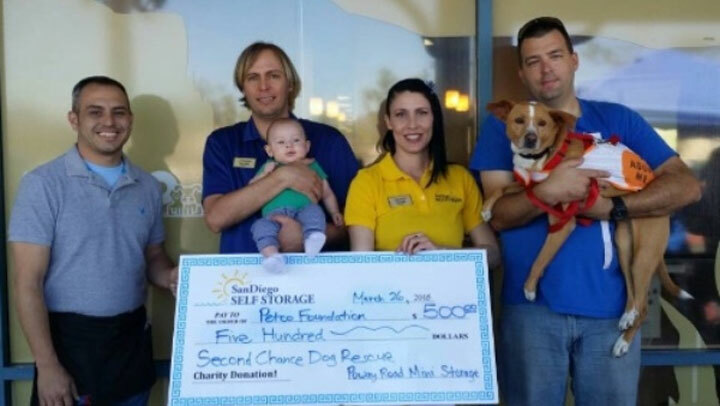 Second Chance Dog Rescue is one of San Diego’s largest and most successful nonprofit 501c3 organizations dedicated to saving homeless dogs. We rescue, rehabilitate and re-home dogs, primarily from local shelters, as well as dogs surrendered by their owners for various reasons, and dogs from Baja California, Mexico. Once we receive a dog, we provide medical care, including spay and neuter, and any necessary rehabilitation.